The same people that brought you the B30 anion just a month ago, now report the B40 anion. This time the popular science press jumped on the news because this anion is not just flat with an hexagonal hole in it (as was the B30 anion) but a cage-like molecule very much like fullerene. The researchers used the same recipe: construct a great many B40 isomers on a computer, simulate their photoelectron spectra, then create a gas of boron clusters, separate by mass in a mass spectrometer, capture each fraction by photoelectron spectroscopy and wait patiently for B40 to fly by. Of course the claim hinges a lot on spectrum gazing and on first glance both spectra (one experimental and one computed) on the left do not even remotely resemble each other. It is more complicated than that, more than one isomer is at play and relative energies have to be taken into consideration. The anion is described as box-shaped (D2d symmetry) with one hexagonal hole and one heptagonal hole. It already has a dedicate Wikipedia page called borospherene. Note to popular press readers: in contrast to neutral fullerene this molecule is charged, it has only been detected in tiny amounts in a gas and it is also not possible to order it by the bottle. Lacosamide is a drug for the treatment of epilepsy. There is no shortage of interest in the production of this compound. The latest academic contribution originates from Sebastian Stecko as single author here. The selected raw material was ethyl lactate 1. Several steps down the road allyl alcohol 2 was reacted with trichloroacetyl isocyanate in methanol to form carbamate 3. Dehydration with trifluoroacetic acid/ triethylamine in THF formed the corresponding cyanate which by a cyanate-to-isocyanate sigmatropic rearrangement first formed the isocyanate and then by addition of methylmagnesium chloride the acetamide 5, all in one step. The double bond was then cleaved with ruthenium chloride/ sodium periodate to carboxylic acid 6. reaction with isobutyl chloroformate / N-methyl morpholine produced lacosamide 7. Should we be really concerned about the new "invisible bomb" terrorist treat making the headlines this week? According to the Guardian here a Saudi chemist allied with both ISIS and al-Qaida (however unlikely that is) has the expertise to create invisible bombs and an ambition to target transatlantic flights. The public is warned that these explosives do not contain metals and therefore will not be detected at airport security checks. The public should ready themselves for delays in air travel. Other sources here and here are certain the explosive is a liquid. Liquid explosives are really nothing special. Wikipedia has a category devoted to it with 17 entries to choose from. A selection: isopropyl nitrate and tetranitromethane. The list even includes binary mixtures such as PLX. Do liquid explosives differ from solid explosives? PLX (used in combination with C-4) has been responsible for the downing of Korean Air Flight 858 in 1987. The chemicals involved in the bombing of Pan Am Flight 103 in 1988 were solid Semtex and PETN. All explosives of this type are solid but malleable, heavy in nitrogen, metals are not involved and the explosives can thus evade airport security. On the other hand, a liquid explosive can be adsorbed into clothing and the Saudi chemist has already had experience in that field. In a nutshell: non-metallic explosives are nothing new, liquid explosives are nothing new. Explosives application: nothing new. Application sophistication: new. Work on taxol total synthesis continues even after 20 years. The latest exploit as reported by Letort here concerns not a new total synthesis as only the core section is synthesised or a new method as the presented cascade metathesis method has been tried before. The novelty is that this time the stereochemistry is correct. The precise target is molecule number 23 (of 44) of the 1994 Holton Taxol total synthesis and the method a ene yne-ene ring-closing metathesis. The chosen abbreviation, RCDEYM for this reaction has attracted some ridicule in blogland as it is not very helpful. Compound 1 is the scheme has two alkene groups and one alkyne group. A conflict of interest between the two alkene groups turned out to be troublesome. 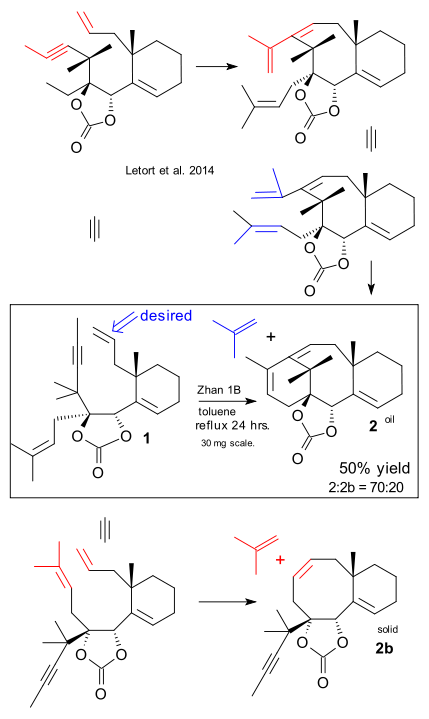 In the desired reaction path alkyne and top alkene engage in an enyne metathesis reaction followed by metathesis utimately forming compound 2. In the undesired reaction the alkyne reacts with the wrong alkene and stops there to form 2b. In the best effort the ratio between the two compounds was 70:20. This result required using a isobutylene group for additional steric hindrance and replacing Hoveyda-Grubbs Catalyst by Zhan 1B which has an additional N,N-dimethylaminosulfonyl group.